The No. 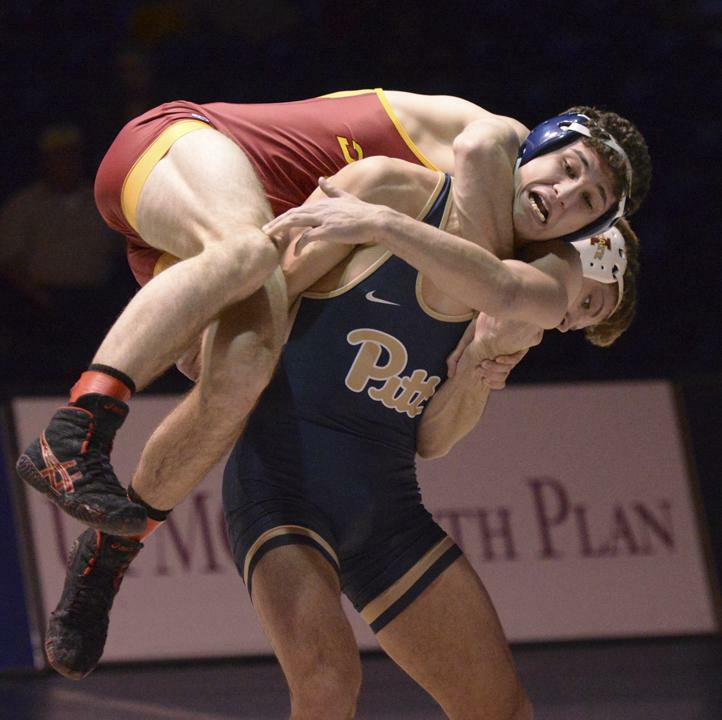 23 Pitt wrestling team appears to be peaking in the postseason, and the Panthers have three individual ACC titles to prove it. Junior 133-pounder Dom Forys (19-1) and sophomore 165-pounder TeShan Campbell (20-2) showed why they came into the tournament as No. 1 seeds, as each won a pair of matches to clinch their first ACC championship. Meanwhile, redshirt freshman Taleb Rahmani (23-6) entered as the No. 3 seed, but won three matches at 157 pounds to claim his first title. After a disappointing start to the season — which included an abrupt coaching change and losses in the team’s first three conference matches — Pitt finished out the regular season strong with three straight wins. The Panthers carried that momentum into the ACC Championships Saturday in Raleigh, North Carolina, finishing the competition in third place with 54 team points. The Virginia Tech Hokies took home the team title with 93 team points, followed by the host North Carolina State Wolfpack with 64 points. As the No. 1 seed at 133 pounds, Forys received an automatic bye into the semifinals. There he met up with No. 5 seed Dennis Gustafson of Virginia Tech, the 133-pound ACC champion in 2014. Forys jumped out to an early lead with a pair of first-period takedowns and led 7-1 entering the third period. He seemed ready to coast to victory, but Gustafson made things interesting with an escape and takedown to narrow the score to 7-4. Forys escaped and held Gustafson off the rest of the way for an 8-4 win. He then took on No. 3 seed Jamal Morris of NC State in the 133-pound finals on Saturday night. While there wasn’t much action in the match, Forys executed his plan to perfection to capture his first ACC title with a 5-0 victory. At 157 pounds, Rahmani started with a 10-2 major decision over No. 6 seed AJ Rechenmacher of North Carolina. He then squeaked past No. 2 seed Thomas Bullard of NC State with a 4-2 decision win to punch his ticket to the finals. There, Rahmani was matched up against top-seeded Sal Mastriani of Virginia Tech. Despite going up against a more experienced and established opponent, Rahmani never appeared rattled. He spent the first minute of the match defending Mastriani’s attacks — all while setting up his own trademark move. Late in the first period, Rahmani struck. With Mastriani working on double underhooks, he locked up Mastriani’s arms behind his back and flipped him to the mat. He held him there for a four-point nearfall to take a 6-1 lead after the first period. Then, while leading 8-3 late in the second period, Rahmani again stuck Mastriani on his back for a four-point nearfall to take a 12-3 lead into the third. He held on the rest of the way to lock up a 13-5 major decision and his team-leading 23rd win for his first ACC championship. Campbell also received a bye as the No. 1 seed at 165 pounds, but No. 4 seed Ray Bethea of Virginia tested him early on in the semifinals. A pair of first-period takedowns along with a stalling call against Bethea gave Campbell a 5-1 lead entering the second. But Bethea quickly escaped and took Campbell down in the second period to make it a one-point match at 5-4. Campbell escaped to make it 6-4 before receiving a stalling warning of his own. He then turned up the pace, adding another takedown to make it 8-4 going into the third period. There, he added another escape and takedown to pick up a 12-4 major decision and make his way into the finals. Like Forys, Campbell cleaned up his mistakes and wrestled his best match with the championship on the line. He took the mat for the 165-pound finals Saturday night and put on a clinic against the No. 2 seed, NC State’s Brian Hamman. After a scoreless first period, Campbell took a 1-0 lead with an escape early in the second. Hamman then shot in deep for a takedown, but Campbell never ceded control and quickly reversed into top position. Referees gave the takedown to Campbell, and after a coaches’ challenge from NC State, the call stood. Campbell took a 3-0 lead into the third period, then added another takedown and a riding time point for good measure to claim his first ACC title with a 7-0 victory. Elsewhere, No. 14 heavyweight Ryan Solomon nearly repeated his upset of No. 5 Jacob Kasper from the Panthers’ regular season finale against Duke. Solomon took Kasper to overtime in the 285-pound semifinals, but couldn’t escape from bottom in the second tiebreaker period and fell, 2-1. Solomon then wrestled his way back to a third-place finish with a 5-3 decision win over North Carolina’s Cory Gilliland-Daniel, securing his third straight trip to the NCAA Tournament. Although Kocher seemed satisfied with the team’s performance, he emphasized that bigger goals still lie ahead. Pitt’s four NCAA Tournament qualifiers will compete at the 2017 NCAA Championships from March 16-18 in St. Louis, Missouri.